It's only fitting that the D.C. area's wettest year on record is ending with rain. Monday has been damp and dreary and about a half-inch of rain had fallen in D.C. by the early evening, Storm Team4 said. Showers are expected to stick around for New Year's toasts at midnight, with temperatures in the low 50s. Make sure to have your umbrella or raincoat handy if you're out ringing in 2019. The dreary drizzle didn't stop people from celebrating Monday night. Hundreds of people showed up for the annual First Night Alexandria event, a family-friendly and alcohol-free celebration. Families enjoyed dozens of activities throughout Alexandria for the event including face painting, carnival-style games and characters in costume. "It's wonderful for the kids, great for our family. A lot of good connecting with other individuals," one woman at First Night told News4. 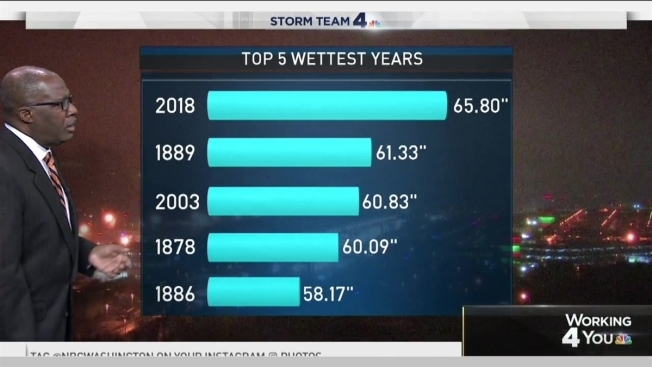 Nearly 66 inches of rain fell in D.C. in 2018. In second place, about 61 inches fell in 1889, and a little under 61 inches in 2003. Showers are expected to end overnight, but some mist or fog is still possible as the rain ends. Most of New Year's Day will be dry, with just the chance for a stray shower or two very early. More importantly, it will be mild — at about 15 degrees above normal — with highs near 60 degrees. Looking further ahead, there's a chance of showers again starting Thursday. We're looking at highs in the high 40s and low 50s on Wednesday, Thursday and Friday.